The Big Mac Chant Challenge is the latest craze in town. It is perhaps one of the best marketing efforts by McDonald’s in recent memory. 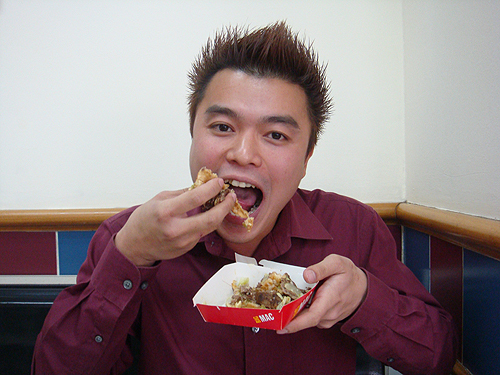 However, I would like to propose a new challenge – The Big Mac Chomp Challenge. You can probably do the Big Mac Chant within four seconds…but can you do the Big Mac CHOMP within four seconds? I used the coupon I won yesterday to redeem a Big Mac and got the McDonald’s staff to clock me doing the Big Mac Chomp. My first attempt started well but Faye accidentally pressed the stop button just as I was taking my first bite so I had to do a second take. It’s here for entertainment purposes. Luckily you didn’t choke to death bcos of eating Big Mac. LOL you finish 3/4 of it, so you are now a 3/4 man and ehhem… 1/4 boy? That was fun to see though. Remind of your speedy Mandarin speaking too. you are the man, HB. hahahaha that is crazy. i was so scared you were going to choke!! ahhh HB you dissapoint! I could do that in 2.3 sec easy! Secondly, and somewhat OT: Did you recover fully from your previous misadventures, and hopefully are healthy and better now? As you may see if you visit my blog, I had horrendous experiences withdrawing from purely prescribed meds, and am still slowly recovering to full health. Is this a story you will ever tell, or do you just wish to put all the past behind you? HELL YEAH! Sixth Seal is back! Good to see you looking healthy again bro. Classic post too man. 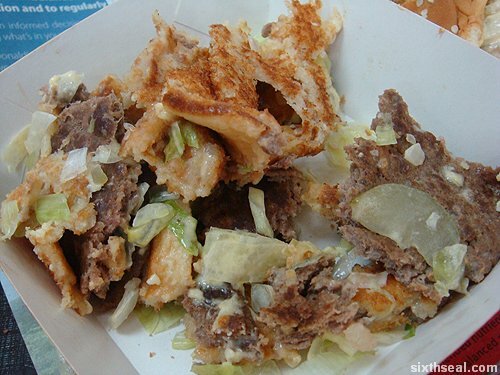 I am going to to McD’s after work to take a shot at the Chomp Challenge. Ill let you know how that works out meng. That McD dude that Anak Pak Lah was talking about…isn’t she a gal??? And boy!!! He hasn’t seen suituapui yet!!! Hahahahahahahahahaha!!!!! Welcome back Brother! It is delightful to see you coming back to the blog sphere. Been waiting a while for 6thseal. We will meet soon. HB its good to see you back, kicking and posting again. Theres a web crawler that has all of your old posts should you be missing any of them. Let me know via email if you would like to know which website it is. As I do not know what your stand is now after the haitus of a year or more. But its good to see you back. fish fish: indeed! that’s why i thought i could do the big mac chant easy…coz i speak really fast in normal conversation anyway. it’s not my first choice too. i usually go for the spicy chicken mcd. or the mcfish. JW: really?!?!?! you can SWALLOW a big mac in 2.3 seconds? i would seriously pay good money to see you do that. suituapui: er…she’s a girl? i didn’t know that too! nightsun: thanks buddy, it’s good to be back. i will email you tomorrow about the web crawler thing. thanks! Cristiano: there’s actually two…one is in Wisma Sanyan but it only serves desserts, ice cream and mcflurries. Myst3: Thanks bro. Missed your comment the first time, for some reason MT registered it as spam. Cheers for the support!